This post is long overdue! I get asked a lot from friends and readers on baby gear that we use the most. Now that Zoe is almost 6 months old – we have a few things that I have found really useful. I must have read so many books, internet forums, blogs, spoke to friends, the information overload drove me crazy. If you are a soon-to-be-mama or a new mom – then you know what I mean. I must have literally spent 10 hours just reading reviews for a gym/playmat before getting ours. Point being, I know how overwhelming and confusing it gets. Anything that makes your life easier as you figure out the ropes of parenthood, yeah – please tell me all about that! Therefore, I am sharing below ONLY those products that I seriously LOVE and have found useful. Hope this list helps. Let me know if you have any questions. Playmat / Baby gym: Started using this one when Zoe was around 6 weeks old. It has developmental toys, a voice recorder, light up pieces and is very colorful. It is also great for tummy time as there is so much stimulation on the mat as well. It gets more and more interesting with time as they start to utilize its full potential. Now Zoe loves kicking the arches and the little mirror is an object of much intrigue. Reason I chose this was that it has elements for sensory and motor skill development and many pieces for the baby to get entertained by. Bassinet Mobile: Started using this mobile in the bassinet around when Zoe was four weeks old. It was one of her first favorite toys and she loves it even now. mamaRoo: Started using the 4Moms mamaRoo around when Zoe tuned 3 months old. It is also great for making them sit upright after a feed. And a safe place to have them chill and watch you while you are getting work done around the house. 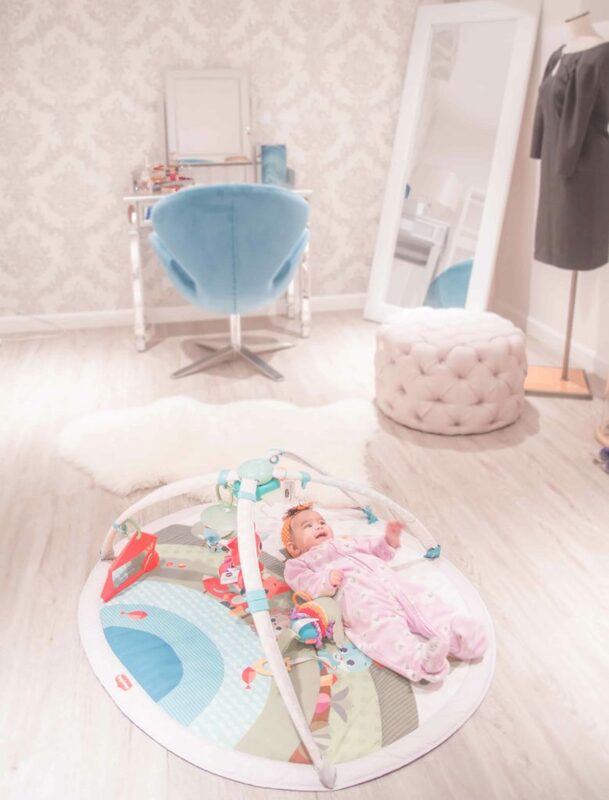 I think, there have been a couple of instances when she fell asleep by being rocked by the mamaRoo … ummm – winner right there! It reclines fully, sways, bounces – lot of fun movements and gives different vantage points to the baby while chilling. Sit me up chair: We started using the sit-up chair around when Zoe turned three months old. Basically, once they attain head/neck control. I love it as it encourages them to sit upright . The little toys the chair comes with keeps them entertained and stimulated. We keep it on the dining table when having dinner, so Zoe can watch us eat and be part of the dining table routine. It’s perfect till they transition on to the high chair. Infant Tub: I was very impressed this little tub. It comes with a water temperature display to indicate if the water is too cold, too hot or just right. I know as new parents, the doctors warn you of these small things to be careful about. This little display is so helpful when we are taking small ( but big ) decisions such as if the water temperature is right for our baby. And it fits our sink perfectly. Also, the tub has side drains so the dirty water doesn’t stay inside. Honestly, there are so many functional details that baby gear come with – they just impress me every single time. It is definitely one of my favorite bonding times – we play music, have bath toys , sing … what’s not to love about bath time. Zoe loves it… her mumma and addy love it. Filing nails while they are soft after a bath – now that’s another story! SNOO and Halo Bassinet: We used our Halo Bassinet Swivel Sleeper from the start and had it in our bedroom until Zoe turned two months old. ( my Halo Bassinet review here ) After the night-time regular feedings stopped, we started using the SNOO for night-time sleeping in our bedroom. The Halo is now in our living room that we use for day time napping. I have never been as impressed with technology as I have after meeting SNOO ( my full review here). To reiterate, it is one of my most hight recommended baby gear. White noise machine: We have been getting Zoe to sleep in different places so she’s not dependent on one bassinet or one place. The Hatch Rest is what we have been using for white noise and works great. It has so many beautiful sounds and light options and I love that they can be controlled from a phone app. The soft rain sound is so soothing, that I use it even when I am working. Baby Carrier : This is seriously a must-have! Makes our lives so much easier. If baby wants to be carried around and you have to get stuff done, this is a life saver. 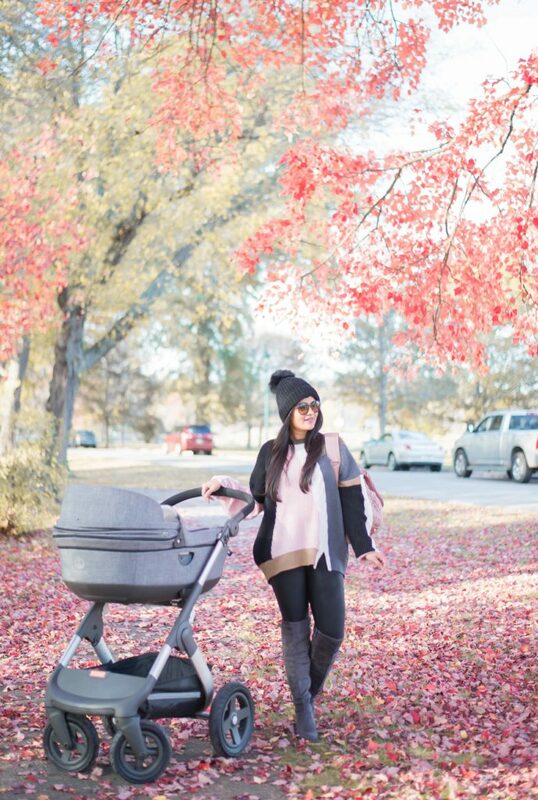 We have been using the Tula Free to Grow carrier and love it. One question that I had a few people ask was the settings for mom and dad – so on that, Amit is very tall and I am on the shorter side, but the adjustable height straps work perfectly for both of us. Once you know your settings, it is pretty quick to adjust. Diaper Bag : I get a lot of questions for a diaper bag that I would recommend. I have a few of them, but the Happ and Citi Babies are my favorites. The Happ is stylish and functional. I use it to carry the pump and accessories to work or while travelling. The Citi Babies backpack is another favorite. It is gender neutral so we carry this mostly when going out since dad can carry it too. Comes with so many pockets, changing pad, helps keep everything super organized and is very affordable. Monitor : We have the Project Nursery monitor and cannot imagine not having it. It has been a major essential for us. Amit and I are usually working downstairs late in the night, so to be able to keep an eye on Zoe is everything. My favorite thing is the monitor bracelet, so I can move around the house and have the monitor on me at all times. Some of our friends use two-way facetime on the phone and that works fine if you need it for few instances. Hatch Baby Grow : We got this just recently but I really wish that I had gotten this much earlier. With breastfeeding, there just isn’t any way to tell if your baby has had enough or not. I remember calling the doctor or the lactation consultant almost every other day because I wasn’t sure if she was eating enough or not, was putting on weight or not, if I was doing it right or not. And once to calm me down, the lactation consultant called us to her office, asked me to feed while in the office, checked the before and after feed weight to alleviate my concerns. Now this is really a hyper case scenario but as a new mom, you need the reassurance that you are doing it right. The Hatch Baby Grow is a smart changing pad that connects to your phone via bluetooth and helps you keep track of baby’s feedings, weight, etc.Even as we are transitioning to solids, the feed patterns are changing. So this comes in handy if you are concerned that baby isn’t eating enough. Humidifier: You need it especially if you live in places where the temperature is cold or gets dry. Babies tend to have dry skin, so having a humidifier definitely helps. Also helps when they have congestion. We have been using this one and love it. Nose Frieda: I literally hadn’t heard of this until when Zoe had a really bad cold. We had been using the blue pump that the hospital gave us but when I mentioned on instastories, I was surprised ( and slightly embarrassed for not knowing about this) at how many moms suggested this. Get this moms! It takes the snort out in the most seamless way. Health/Grooming Kit: For basic things such as filing nails ( I swear her nails grow at the speed of light and if we miss a single day of filing, next morning she sure has scratched herself to remind us of our bad parenting – ugh! ), rectal thermometer, baby hair brush, medicine dispenser, etc – we got this kit. Dish soap – For washing bottles and pump accessories – Babyganics dish soap. I am also very particular about sterilizing everything , every single time and use the Born Free Sterilizer. Bath – We use Aveeno and Honest products. Body Massage – Love this almond oil. ( I also love using it on my post pregnancy belly ). Also, love Honest oil for post bath moisturizizing. I get asked quite often on what items I bought before baby arrived/what I registered for. 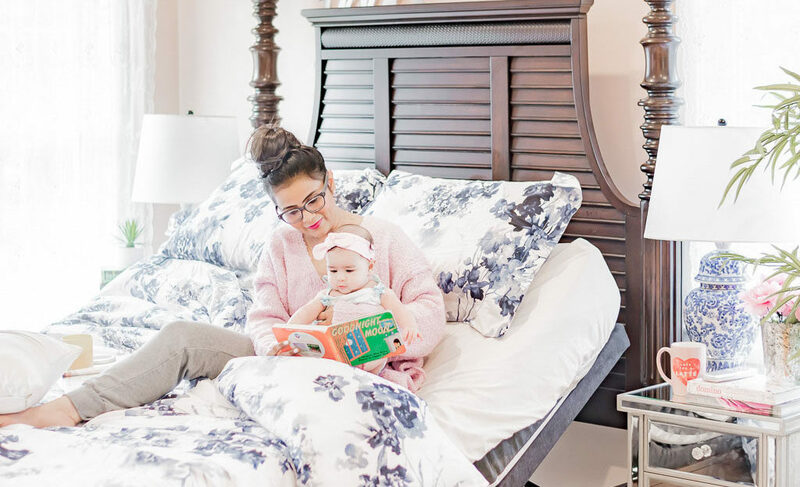 So here’s what we did – I registered at Amazon, BabiesRUs and Target but those registries were only for myself so I can shop as and when needed and get the benefit of the registry discount. I will also be doing a separate post on Nursing, Feeding and Pumping Essentials. Love all your baby essentials! 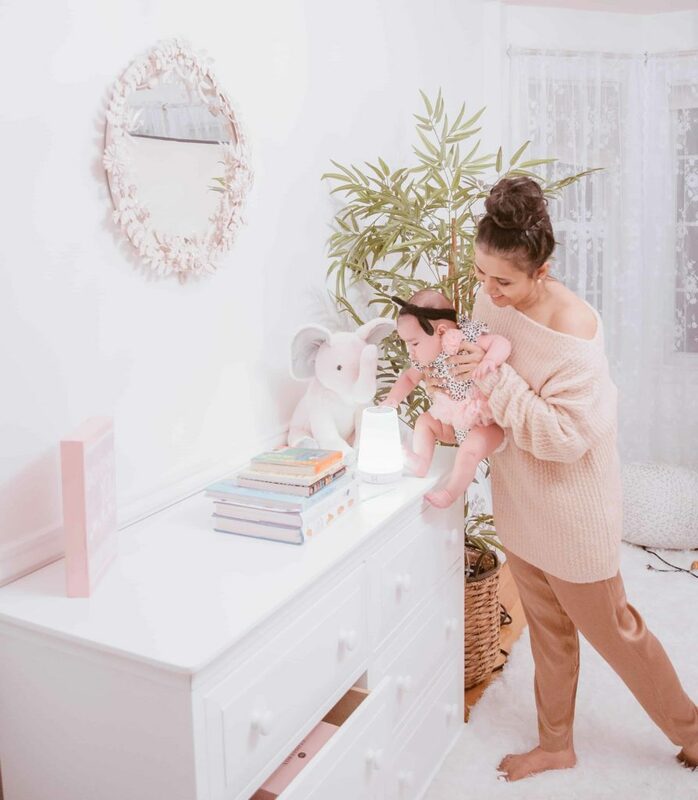 Her nursery is super cute! Your baby essentials are awesome. Love these essentials! So cute! She’s sooo adorable! She seems to be enjoying all her stuff! Really cute baby gears you have here dear. I absolutely love the stroller, looks so durable. If you ever decided to get a new monitor I LOVE the nest one its connects to your iPad and phone so you can watch your baby if you have a sitter!! LOVED this roundup!! So much adorable baby gear. I love it. Really it such an informative post. These are all super reliable and trusted essentials. I think using a trusted brand for your baby is very important. These are all must haves.